Hi! My name is Lisa Berggren! My name is Lisa, and I am a Disnerd (all together now… Hiiii Lisa). Like so many others I caught the Disney bug as a kid, and I can’t shake that Jiminy Cricket off my shoulder. Now I live in a world of magic and wonder, when I sprinkle my pixiey dust and whisk families away on their Disney adventures. As a travel agent with MickeyTravels, I have the privilege of experiencing the wonder of Disney again and again through the eyes and Mickey ears of the families I serve. My motto is: Dream it, Plan it, Do it – and that is what I do best. I am the mother of one amazing little princess, wife of Grumpy, and fairy godmother to hundreds of children as Youth Program Director in my real world job. I am a New York City native, now an Atlanta suburban mom by way of Penn State (Go Big Blue)! In my day to day, I race around with a toddler in tow; cook feasts fit for royalty and picky eaters; share monster laughs with friends; and dig, dig, dig, dig, dig deep into Disney research and planning to make your trip nothing less than magical. A Disney vacation will leave you speechless in the moment, but create memories and stories to share for a lifetime. Let me and Jiminy be your guide through it all. 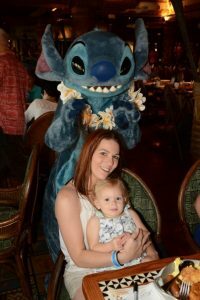 Welcome to my Disney family – Ohana!